You may initiate an additional challenge during the challenges phase. 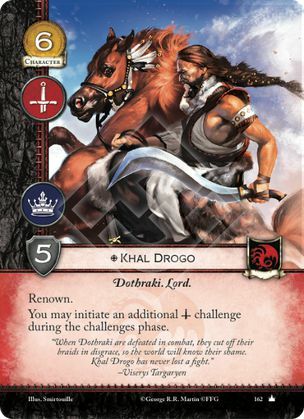 If I have Khal Drogo and Storm of Swords, how many military challenges can I initiate? Three. You can normally initiate one military challenge. There are two effects (Storm and Drogo) granting you a permission to initiate an additional challenge, so you can initiate two additional mil challenges for a total of 3.